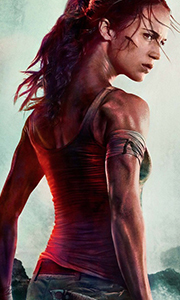 Lara Croft, the world's most famous video-game heroine, bursts onto the big screen in "…the most stylish and entertaining action-adventure movie in years!" Exploring lost empires, finding priceless treasures, punishing villains in mortal combat.. It's all in a day's work for adventurer Lara Croft (Angelina Jolie). But a secret from her father's (Jon Voight) past is about to lead Lara to her greatest challenge: the triangle of light, a ..
Lara Croft: Tomb Raider: Archaeologist and explorer extraordinaire Lara Croft (Angelina Jolie) goes on a death-defying journey as she tries to find the mythical Triangle of Light in this pulse-pounding, action-adventure film that will have you sitting on the edge of your seat!Lara Croft Tomb Raider : The Cradle Of Life: Lara Croft (Angelina Jolie) is back in action and faces her most perilous mission: to recover what ancient civilisa..
Lara Croft: Lara Croft, the world's most famous video-game heroine, bursts onto the big screen in "...the most stylish and entertaining action-adventure movie in years!" Exploring lost empires, finding priceless treasures, punishing villains in mortal combat... it’s all in a day’s work for adventurer Lara Croft (Angelina Jolie). But a secret from her father’s (Jon Voight) past is about to lead Lara to her greatest challenge: The Triangl..
Lara Croft (Angelina Jolie) is back in action and faces her most perilous mission: to recover what ancient civilisations believed to be the essence of all evil, Pandora's Box. She must travel the globe, from Greece to Hong Kong to Kenya and beyond, to get to the box before it's found by a maniacal scientist (Ciaran Hinds) whose plan is to use it for mass annihilation. For this adventure, Lara recruits her ex-lover - Terry Sheridan (Gera..
Own Lara Croft - Tomb Raider 2 - The Cradle Of Life DVD from Deff, DVD, Blu-Ray & 4K Video Specialists - Free UK Delivery..
Lara Croft (Alicia Vikander) isthe fiercely independent daughter of a missing adventurer, is driven to solve the puzzle of her father's mysterious death on her own. Armed with only her sharp mind, blind faith and inherently stubborn spirit, Lara must learn to push herself beyomd her limits as she braves the perilous journey into unknown lands, and ultimately earns the name of tomb raider.Special Features Lara Croft: Evolution Of An Ic..
Lara Croft, the world's most famous video-game heroine, bursts onto the big screen in "...the most stylish and entertaining action-adventure movie in years!" Exploring lost empires, finding priceless treasures, punishing villains in mortal combat... it’s all in a day’s work for adventurer Lara Croft (Angelina Jolie). But a secret from her father’s (Jon Voight) past is about to lead Lara to her greatest challenge: The Triangle of Light, ..
Lara Croft (Alicia Vikander) is the independent daughter of an eccentric adventurer who mysteriously vanished when she was a teen. Determined to forge her own path, she refuses to take the reins of her father’s global empire just as she rejects the idea that he’s truly gone. Against her father’s final wishes, Lara leaves everything she knows behind in search of her dad’s last-known destination: a fabled tomb on a mythical island. Her mi..
Own Lara Croft - Tomb Raider - The Cradle Of Life 4K Ultra HD from Deff, DVD, Blu-Ray & 4K Video Specialists - Free UK Delivery..
LARA CROFT: TOMB RAIDER - Exploring lost empires, uncovering priceless treasures, engaging in mortal combat...danger is the name of the game for adventurer Lara Croft. But a legendary artefact, a power-hungry villain and a secret from her father's past are about to propel her into her greatest challenge yet. Lara Croft: TOMB RAIDER : THE CRADLE OF LIFE: This time, Lara Croft pushes the limits of adventure even further trying to keep th..
Own Lara Croft - Tomb Raider 4K Ultra HD from Deff, DVD, Blu-Ray & 4K Video Specialists - Free UK Delivery..